Bunny fans in Kerala are gearing up to welcome the movie his upcoming movie which is slated to release in the month of May. 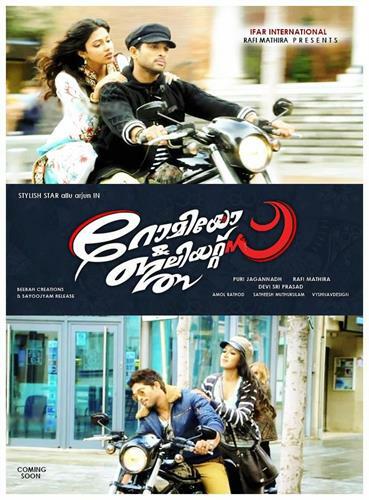 Titled 'Romeo and Juliets', it will be the malayalam version of telugu movie 'Iddarammayilatho' which means 'With Two Girls'. Directed by Puri Jagannadh, the movie will feature heartthrob Allu Arjun, Amala Paul and Catherine Tresa in lead. As Allu Arjun is having a huge line of fan followers, almost all of his movies were released in Kerala. After Arya, Bunny, Badrinath and Gaja Paokkiri, the man of mass 'Allu Arjun' is on the way to enthrall the young folks. Khadar Hassan who introduced the vibrant actor Allu Arjun to the audience in Kerala was taken close to the hearts with his unique dance, acting and dialogue presentation. Allu Arjun who has delighted millions through his movies will give a rocking performance in 'Romeo and Juliets'. After Arya, Bunny, Badrinath and Gaja Pokkiri, the much hyped movie 'Iddarammayilatho' produced by Bandla Ganesh under the banner of Parameswara Arts will be released on 10th May 2013. It is expected that the malayalam version 'Romeo and Juliets' would also be released on the same day. Producer Bandla Ganesh Babu has cashed a huge amount for this romantic entertainer which had been shot in exotic locations like Spain and Bangkok. The movie is themed around an Indian youngster who falls in love with two young girls while staying in Spain. Puri Jagananath who is known for his stylish making will give a better look for the movie. Allu Arjun would be appearing in lavish looks with 60 different costumes. 'Romeo and Juliets' would be much special to watch with a number of reasons. Popular cinematographer Amol Rathod who is known for his active presence in Bollywood has lent his hands to zoom the exotic locations. Bollywood choreographer Ganesh Acharya who had worked with Bodyguard, Singham andOmkara has applied some unique dance steps bringing the best visual treat for dance enthusiasts. Watch out the breath taking action sequences set by Hollywood stunt choreographer Kaeche Kampakdee who had worked with action movies like Blood Sport 2, Ong Bak 2 and Sanctuary. Expertise in Muay Thai martial art, Kaeche was paid Rs 2 Crore for the six action sequences in the movie 'Romeo and Juliets'. As Kaeche Kampakdee shouldering the action sequences, this movie would prove to be the best action films in Allu Arjun's acting career. For Ifar International this movie is presented by Rafi Mathira. So get ready for a high voltage Allu Arjun movie which would keep your mind fresh.